It's time to link in your best post of the week! 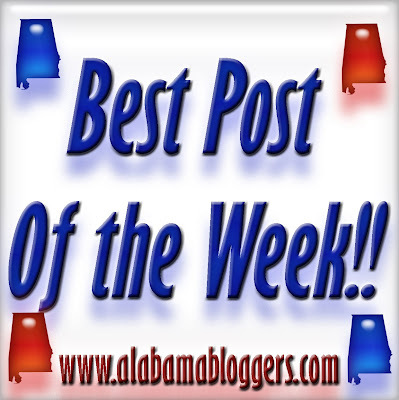 The purpose of this column is to make it easier to keep up with each other's blogs, so that even if we don't have time to read all of the Alabama Blogger blogs every day, at least we get the week's highlights. So, link up, tell us why you linked that post, and let's start reading! And remember - the best way to get new blogging friends is to comment on other people's posts, so be sure to say "hi" to your neighbors when you visit! p.s. - please feel free to interpret "this week" as loosely as you like! 3. Birmingham Blogging Academy - three tips on using Pinterest as a pro. 4. Pinterest - my favorite pin this week, a look at the new Regions Field in downtown Birmingham, the new home of the Birmingham Barons. My post for this week talks about my sketchbook and how I use it to remember everything as well as what types of information I put in there. If you haven't linked up and introduced yourself yet, be sure to go here to do so! Link Up and Introduce Yourself! How YOU can contribute to Alabama Bloggers! Healing and Help Comes to Pleasant Grove. Giveaway, Discount to Freestyle Motocross!